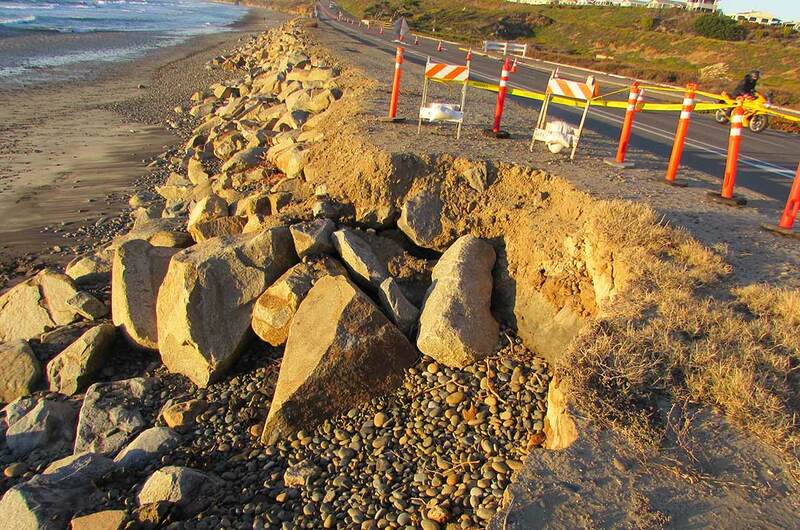 CARLSBAD — The City Council approved an emergency resolution after weekend waves tore apart a stretch of Coast Highway 101, between the Encinas Creek bridge and Island Way. Massive waves shredded about 300 to 400 feet of the bluff near the highway, eroding the buffer away and leaving rocks covering the shore. At one spot, near lifeguard tower No. 28, the road is just feet away from eroded sand wall. Pat Thomas, director of public works for the city, said the embankment along the road was compromised and city crews must act quickly before another swell drums up on the coastline. The city closed a quarter-mile stretch of one southbound lane on the highway Tuesday, which will remain closed for as long as it takes to repair the embankment, Thomas added. He said the road could reopen between 30 and 60 days, although he cautioned it could take longer due to various factors including obtaining permits. As for motorists, Thomas said he doesn’t expect any issues, although he said pedestrians and cyclists should proceed with caution. “We don’t anticipate a huge amount of congestion,” he added. Thomas added the emergency status allows the city to obtain permits faster from the Coastal Commission, Army Corps of Engineers and state parks, the entities controlling the coastline. John Maashoff, also of the public works department, said initial plans are to place two- and four-ton boulders along the damaged area to mitigate erosion. The issue, however, is another round of expected high tides, especially on Christmas Eve. “The combination of high surf and high tide last week, we saw some substantial erosion,” Maashoff said. As for the cost, Maashoff could not estimate an exact figure, although the city must begin work as soon as possible. Since the emergency response was initiated, Maashoff said the cost would not be tallied until work is completed. Mayor Matt Hall said the city might qualify to apply for reimbursement grants from state and federal agencies. He compared this situation to a similar incident in 2010, about 100 yards or so down from the current affected area. Nevertheless, Maashoff said work is expected to begin next week, however, if “interim” repairs are accessible, then crews would start before then. “Next week the surf is only predicted to be two to three foot,” he added. Maashoff also said Carlsbad officials are in contact with the city of Encinitas, which is dealing with a similar situation. Looking ahead, Maashoff said protecting the coastline now may be a bonus considering the expected strong El Niño season forthcoming.